This op-ed by our president, Mitch Hagney, appeared in the Rivard Report. On Thursday, City Council raised the number of backyard chickens that San Antonians can own without a permit from three to eight. Council approved amendments to the City’s Animal Care Services (ACS) code, including several to better define the rules for “domestic fowl” at residences, more than doubling the number of birds allowed. The Food Policy Council of San Antonio‘s vision is to create a vibrant local food economy, with healthy, sustainable, affordable food accessible to all. To that end, one of our goals is to protect and expand the right of everyone to grow their own food. As president of the non-profit, I have watched first hand as those who grow at least some of their own food, including eggs and poultry, develop long-term food security and gain foundational knowledge about agriculture for themselves and their community. Chickens, ducks, or guinea hens can help reduce pests and provide fertilizer in a vegetable garden, or they can be raised on their own to provide protein-rich homegrown foods to families. While no official count exists, there are likely tens of thousands of backyard birds already being tended to throughout the city. 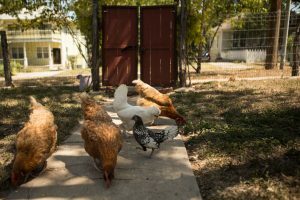 Residents in many San Antonio neighborhoods have long traditions of keeping domestic fowl for eggs and meat, and others have been adopting the practice in recent years. Kim Rocha, administrator of the nearly 4,000-member Facebook group San Antonio Area Backyard Chickens, coordinated many of her members to engage in local activism. Any home can have up to eight domestic fowl, including one rooster, without a permit. An excess animal permit is needed for more. The coop must be at least 50 feet from the nearest neighboring dwelling. Chickens must primarily be kept in a coop at least 24 sq. ft. in size, or six sq. ft. per bird, whichever is larger. Chickens can roam outside of the coop or run as long as they stay in the boundaries or a yard, between 6 a.m. and 10 p.m. Sanitation and food must be addressed in a manner that prevents attraction of pests. The fowls’ area is subject to inspection from Animal Care Services. These rules put San Antonio in line with cities that have progressively embraced urban agriculture, though not quite to the level of Austin’s subsidized backyard chickens. Homeowners associations can still declare their own restrictions, but these choices represent an important precedent of loosening rules related to urban agriculture. This policy change signals clear municipal support for current chicken owners and for sustainability-minded future residents considering whether San Antonio fits the bill for the type of city they want to live in.For those interested in these and other efforts spearheaded by the Food Policy Council, which includes a Healthy Corner Store initiative, a citywide food insecurity study, incentives for urban farms, reducing sugar consumption, and strengthening connections between farms and schools, there are ample opportunities to get involved. General meetings are open to the public on the third Wednesday of every month at 12 p.m. at Eco Centro. Work group meetings for each topic occur monthly.